Accident kills 1 on I-95 near Sebastian/Fellsmere exit. 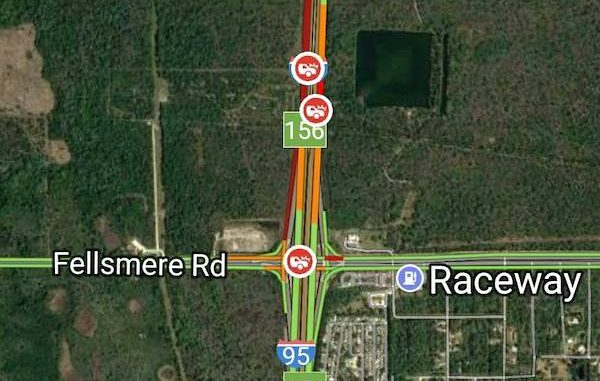 SEBASTIAN – A vehicle crash north of Sebastian near Exit 156, Fellsmere Road, killed 1 person and shut down I-95 in Indian River County. On Saturday night, at approximately 8:25 p.m., four vehicles were in a crash which shut down the Southbound I-95 lanes for several hours. Devi Sookdeo Singh, 45, of West Palm Beach, died at the scene. She was a passenger. The Florida Highway Patrol (FHP) said she wasn’t wearing her seatbelt. The driver, Ryan Sookdeo Singh, was taken to Holmes Reginal with minor injuries. There was also a 21-year-old and 14-year-old in Singh’s vehicle. Both were wearing seatbelts. They were both treated for minor injuries at Holmes Regional. Leah Duthil, 23, of Titusville, was traveling northbound on I-95 in the outside lane next to Singh’s vehicle. Duthil switched lanes, colliding with Singh’s car, causing it to spin around and overturn over the median guardrail and into the southbound lanes. Singh’s vehicle came to rest on its roof. Two other vehicles going southbound then collided with Singh’s vehicle when it overturned in the southbound lanes on I-95. The FHP says Duthil was not transported to the hospital and that alcohol tests are pending. FHP is still investigating the accident. Will there be snow flurries in Sebastian and Vero Beach?